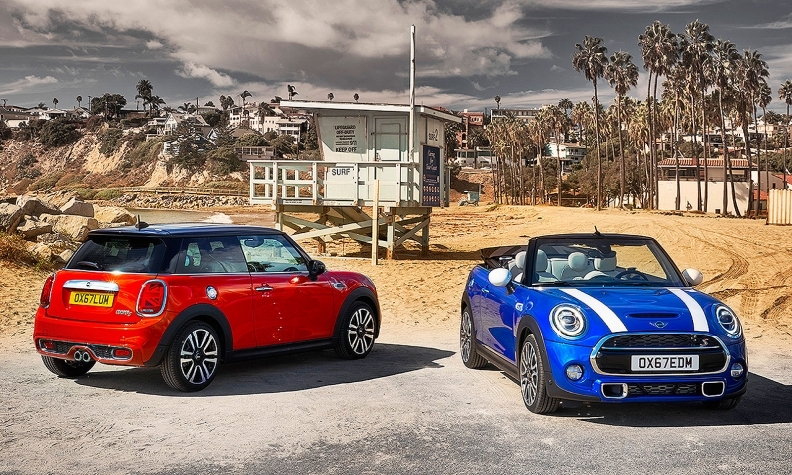 Mini is freshening its core small cars with updated design elements, new technology and expanded digital services. The 2019 models of the Mini Hardtop 3 Door, Mini Hardtop 5 Door and Mini Convertible will go on sale in the Canadian market in late March or early April, according to a new release from Mini Canada. Pricing for the 2019 models will be released closer to the sale date. The vehicles carry a modified version of Mini's characteristic circular headlights. The rear lights, when paired with optional LED headlights, feature a new Union Jack design to evoke the look of the British flag. New exterior paint colours and wheel designs are available. The updated models also will carry Mini's new logo -- a two-dimensional or "flat" re-interpretation of the brand's existing logo. On the interior, new seat materials and other new surface trims are available. A new 6.5-inch instrument panel display is standard with a new 8.8-inch touchscreen display available as an option. Mini says the vehicles have a better user interface with Bluetooth mobile phone integration and support for Bluetooth audio streaming. The three vehicles also include a wireless charging option. For the first time, the Hardtop models are available with a Mini logo projection feature that projects the logo on the ground when the vehicle is opened and closed. Through its Mini Connected program, the brand is adding a range of digital services to the vehicles. New features include advanced real-time traffic information with 4G LTE connectivity, support for Apple CarPlay and other connected services. For instance, drivers using the personal mobility assistant feature available through the Mini Connected smartphone app can link calendar entries to the car's navigation system for route planning, including departure alerts, using real-time traffic data. One service that will be available in the new vehicles is the Mini Find Mate function. Owners can put tags with a wireless tracking function on frequently used objects and travel items such as bags, cases, key rings and rucksacks. Their position can be displayed on the on-board computer and also in the Mini Connected app on a smartphone. It’s designed to prevent personal items getting lost or left behind. An activation date for Mini Find Mate in Canada has yet to be determined.